Our most popular single raised dog bowl, the Mesh Elevated Dog Bowl features a simple cross pattern, with non-skid plastic tips on feet of the raised dog dish feed stand. The popular Mesh Elevated Dog Bowl is compact and consumes less space than conventional two-bowl feeders. This single elevated dog bowl feeder allows you to keep check on your dog's food intake, especially when he is on a diet. Its rounded sides keeps food and water centered for ease of eating. 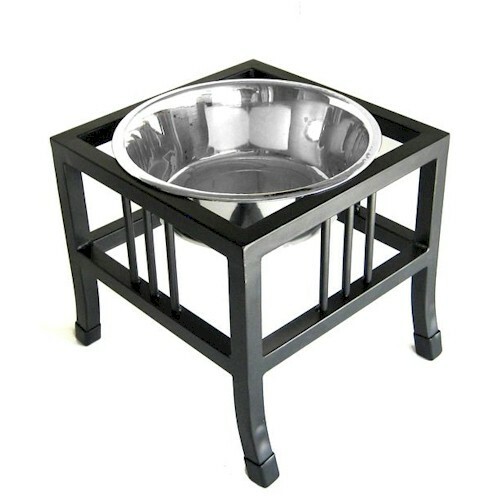 The raised dog bowl stand features a unique mesh design that goes well with any decor. Sturdy wrought iron construction ensures that it lasts a lifetime. Available in Black.